About "ESV Student Study Bible"
Created by an outstanding team of more than 100 evangelical scholars, teachers, and pastors, this study Bible features 12,000 study notes, 80,000 cross references, 900 'Did You Know?' fact files, 120 Bible character profiles, 80 full-colour maps and illustrations, book introductions with timelines, an extensive concordance, and a glossary of key terms. 8.5-pt type, 16.5 x 23.5 x 4.5cm. The ESV Student Study Bible is ideally suited for students who are serious about God's Word-who want to learn more about what the Bible teaches and how the Bible applies to all of life. With 12,000 clear, concise study notes, the ESV Student Study Bible provides numerous new features-including nearly 900 "Did You Know?" facts, 120 new Bible character profiles, and 15 new topical articles. It also features a new glossary of key terms, more than 80 full-color maps and illustrations, an extensive concordance, and 80,000 cross-references. These and many other features make it the most comprehensive, colorful, and content-rich student Bible available today. 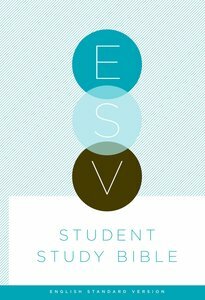 Suited to high school and college students, the ESV Student Study Bible is also a versatile resource for anyone engaged in serious study of God's Word. Created by an outstanding team of more than 100 evangelical Christian scholars, teachers, and pastors, the ESV Student Study Bible is adapted from the highly acclaimed and best-selling ESV Study Bible. With numerous new features, the ESV Student Study Bible is an invaluable resource. For high school and college students, but equally for all students of the Bible-for everyone who loves to read and learn more about God's Word.